La Candela Company was founded and is now directed by dancer Ania "La Candela". Our story begins with Ania La Candela, who left everything to spend over two years in Seville to pursue her dream of becoming a professional flamenco artist. 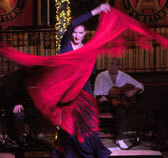 Upon her return from Spain, Ania started La Candela Company to share her love for flamenco and bring flamenco and Spanish music closer to North America. She closely works with guitarists Jose Chirinos and Otto Doble T to bring together the tradition of flamenco from southern Spain, Spanish classical music, Latin jazz, world fusion and the diverse cultural backgrounds of the artists. 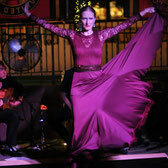 La Candela Company also invites and collaborates with other national and international guest flamenco artists. 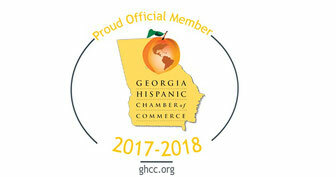 The company produces live flamenco shows in the Atlanta area as well as is available for hire anywhere in the Southeast and beyond, bringing a Spanish flair and captivating, unique entertainment to both corporate and private events. In 2018 La Candela Company expanded to include Latin jazz and world fusion music out of the need for more complete entertainment. Our clients now have an option of booking not only a flamenco experience but also the main entertainment band which comprises of many local jazz musicians and is managed by jazz and flamenco percussionist Jerry Fields. The repertoire even includes Gypsy Kings cover songs! 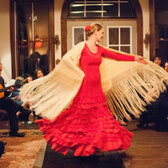 La Candela Company’s mission is to support arts and dance in the Southeast region and bring flamenco and Spanish music closer to North America through state-of-the-art performances that amaze audiences of any age. The company is co-directed by Ania Bartelmus “La Candela” and Jerry Fields, and is comprised of an ensemble of local, nationwide and international dancers and musicians. It brings together the tradition of flamenco from southern Spain, Latin jazz, world fusion and the diverse cultural backgrounds of the artists. Whether you are looking for a main entertainment for your event, or an ambiance performance of Spanish guitar with a Spanish dancer, La Candela can tailor to your needs. Doble T has been playing flamenco guitar for over a decade now. He earned a Bachelor’s of Music Performance from Kennesaw State University in 2008 and has since completely devoted his passions to the art of Flamenco. He has performed with flamenco artists from Andalucía, such as Carmen Ledesma and José Méndez, Miguel Vargas, as well as artists with the National Institute of Flamenco, Vicente Griego and Joauqín Encinias. A formally trained musician, he has formed his Flamenco education studying with some of the most well-known names in the art form locally and internationally including Jerry Fields, Cristian Puig, Luis and Ali de la Tota. Originally from Venezuela, Jose Chirinos is a guitarist and composer. Parallel to the study of classical guitar, he began learning flamenco guitar with masters Flavio Rodrigues, Fernando de la Rua, Pepe Maya, Curro de María, Antonio Españadero and Enrique Vargas. 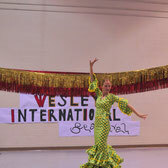 Jose accompanied classes and shows of the best flamenco academies of Venezuela. He participated as a guitarist and teacher in the 4 editions of the International Flamenco Biennial of Maracaibo. Carlos Pacheco is a guitarist and composer residing in NC. He started teaching himself guitar from the age twelve until years later, when he studied Composition and Classical Guitar at the Music Department of the University of Puerto Rico. His first steps into the world of flamenco guitar were ushered in by the Spanish guitarist and singer Antonio Carmona "el Pichuli" and Fernando Moreno in Jeréz de la Frontera. He has been active in the flamenco scene in Puerto Rico since, doing countless performances throughout the island and participated in activities abroad such as the Latin Fever Ball in Atlanta, Georgia. He performed with the Catalan singer Marina Rosell and the renowned singer Rafael Ojeda Rojas Falete in his last performances on the island. He has participated in several record productions and is currently working on his first solo album. Known as a total percussionist, Jerry Fields performs regularly in Atlanta and throughout the southeast on drum-set, timpani, marimba and various world percussion instruments. A Summit Jazz recording artist (Ted Howe Trio), Mr. Fields is featured on the group’s critically acclaimed recording Ellington as well as Elton Exposed. A world percussionist at heart, Jerry has performed with Ania "La Candela" for several years and as well as a number of flamenco artists including Guitarists: Arturo Martinez, Ricardo Diaz, Jose Manuel Tejeda, Luis Linares “el Tiburon”, Christian Puig and John Lawrence. Dancers: Antonio Vargas, Manolo Punto, Barbara Brenton Antonio Hidalgo and Ulrika Frank. 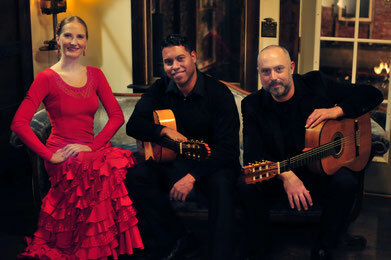 Singers: Alfonso Cid, Marija Temo and Javier Heredia. Jerry is also actively performing with Indian, Greek, Kleezmer, Arabic and African ensembles. José Manuel Garcia, born in Caracas, Venezuela, graduated from Emil Friedman Conservatory in 1992. He received his BM in piano performance from Clayton State College. While at Clayton, he studied with George Lucktenberg and Michiko Otaki. Mr. Garcia earned his Master of Music in piano performance from Georgia State University in 2001, while a student of Geoffrey Haydon. Mr. García holds a Doctor of Musical Arts Degree from the University of Georgia, from the piano studio of Evgeny Rivkin. José is also actively involved as a jazz and flamenco pianist in Atlanta and throughout the United States. He has performed with internationally acclaimed artists such as Michael Philipp Mossman, Ray Vega, Bill Summers, Kemba Cofield, Jennifer Holliday, El “Cano” Estremera, Luisito Rosario, Paquito Guzmán, Anthony Cruz, Willie González, Tito Rojas, Marlon Fernández, Oswaldo Román, Darmon Meador, Joe Jennings, Ilona Knopfler. Luisito Carrión, Ignacio Berroa, María Teresa Chacín, y Juan Carlos Salazar.